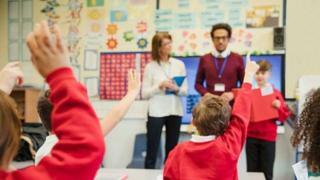 Teachers will take part in a strike ballot if the Scottish government does not improve its pay offer in one week, a union has warned. Minsters have described the current offer as the most generous in the public sector in Britain. But teachers' union, the EIS said teachers felt undervalued. Education Secretary John Swinney gave no indication there would be extra cash for a larger offer at an EIS conference on. It comes days before a planned strike ballot on pay. Mr Swinney said negotiations were still ongoing but warned: "If there is a period of industrial action then clearly the agenda of progress in Scottish education would be disrupted." The deputy first minister added after the conference: "I don't think anyone in the country - parents, government ministers, teachers, head teachers - wants a strike. "The government is making a contribution of a quarter of a billion pounds towards this pay deal - it's a huge amount of public money. "Two out of the three professional associations that have been balloted have accepted the offer and 43% of EIS members voting have voted for it. "The gap between acceptance and rejection of this pay deal is 2,500 teachers out of 50,000 - there are a lot of teachers who want this pay deal and I want to constructively engage in the discussions to resolve these issues." Larry Flanagan, EIS general secretary, said: "The only thing that will stop the ballot will be an improved offer, to date that hasn't been forthcoming but we continue to be in dialogue seeking a negotiated settlement rather than continue to the strike action. The union wanted teachers to get a 10% rise last April. Mr Flanagan earlier said the union would engage with the government on workload concerns but only an improved pay offer could avoid a strike ballot. More talks on pay are planned for early next week. The union plans to open a strike ballot on 11 March and could stage a strike the day before the exams start in April. The EIS event was for head teachers and their deputies and discussed the government's efforts to empower schools. The Scottish government earlier said it believed as much power as possible should lie with individual schools, head teachers and parents. Last year, planned legislation on reforming school governance was dropped - and instead an agreement was reached with councils on what they should do. Despite the long-running dispute over pay threatening to overshadow the conference, Mr Flanagan praised the education secretary's speech about giving teachers more autonomy. He said: "It's ironic that we're in a pay dispute when we're actually on the same page around empowering schools." The EIS supports professional autonomy for heads but also wants to ensure this does not mean more bureaucratic responsibilities. Recently, there have been protests after some councils asked individual schools to find ways to save money. Speaking ahead of his appearance, Mr Swinney said he had made his vision for Scottish education clear - "devolution to schools and empowerment of teachers". He added: "That is why our education reforms are designed to put the power to change lives directly in the hands of those with the expertise and insight to target resources in the most valuable way. "It is a vision that requires the Scottish government, local government and teachers to work together with a range of partners to drive improvement. "Providing every child with an equal opportunity to succeed, a world-class education and the best possible start in life will improve Scotland for all of us, and teachers are at the forefront of making that vision a reality. "That is why we are doing everything we can to empower the profession." Mr Flanagan also welcomed Mr Swinney's apparent support for changes to school inspections and grading. Mr Swinney expressed a wish for a system "where the chief inspector can consider whether or not there is a case for not having grades, but simply having a commentary which gives very clear indications of what steps are required to improve the performance of that school". In response to the comments about inspections, Mr Flanagan said: "You don't want to create an environment where it's fear of failure that motivates people rather than the joy of success. "We would welcome - as the Deputy First Minister did - a look at whether it is appropriate to be ranking school inspections rather than going in and doing what you would do with pupils; identifying development needs without necessarily saying 'you've failed this'."